The Azurion with FlexArm at the Miami Cardiac & Vascular Institute. The Miami Cardiac & Vascular Institute created the Azurion with FlexArm in partnership with Royal Philips. Images courtesy of Baptist Hospital. Katzen said that one of things they did in preparation for this device was to spend a year or two taking photographs of the people in the rooms during procedures and noting how they were positioned, as well as looking at the ergonomics. The FlexArm itself allows the operator to image into the body from any angle and almost any position, while still allowing the ability for multiple people to be working together. This equipment allows for 3-D imaging, with cone-beam CT that can be done from either the front or the side of the patient. 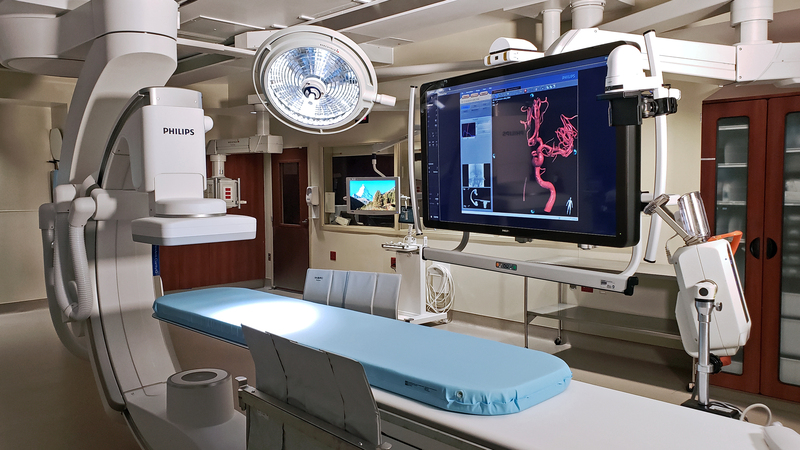 The C-arm can be placed in any position and still maintain its orientation fluoroscopically, giving it the flexibility for positioning the room for any type of procedure, Katzen said. There are two parts of the FlexArm. One is the user interface, which allows the user to move the geometry in any direction with a single button. The other is the geometry itself. “The geometry allows us to, in a simple way, in a single patient, to look at many things,” said Katzen. “We can go from one wrist to the other for instance, or we can go from head to toe. We can go from a left wrist down to a foot. We can get access to the circulation from the foot and the arm at the same time or the abdomen and the arm at the same time and still accommodate the anesthesia people in the room,” he continued. The device has been used for a couple of years, Katzen said, in clinical trials to compare with standards in geometries, and in complicated procedures at Miami Cardiac & Vascular Institute.